WASHINGTON, DC, April 10, 2016 (ENS) – In-depth scientific research and broad-based communications are both needed to get control of harmful algal blooms and low-oxygen conditions called hypoxia in U.S. waters, advises a new report to Congress. From extended shellfish closures on the west coast in 2015, to a larger-than-predicted hypoxic zone in the Gulf of Mexico, to blue-green algae in Lake Erie, harmful algal blooms and hypoxia ruin resources across thousands of miles of U.S. coastal and inland waters. No part of the country or the world is immune. The largest dead zone in the world encompasses the entire bottom of the Baltic Sea. The second largest dead zone in the world is located in U.S. waters – in the northern Gulf of Mexico. These events may threaten the safety of seafood, drinking water and air quality and create large low-oxygen aquatic zones, called dead zones, where nothing can survive. Many physical, chemical, and biological factors combine to create dead zones, but humans create nutrient pollution. Excess nutrients in fertilizers that run off land or are piped as wastewater into rivers and coasts can stimulate an overgrowth of algae, which then sinks and decomposes in the water. The decomposition consumes oxygen and depletes the supply available to healthy marine life. U.S. federal agencies are empowered by deal with these problems by The Harmful Algal Bloom and Hypoxia Research and Control Act of 1998, or HABHRCA. This law has been reauthorized several times by Congress, most recently in 2014 through the Harmful Algal Bloom and Hypoxia Research and Control Amendments Act of 2014. The 2014 amendments reconstituted the Interagency Task Force on Harmful Algal Bloom and Hypoxia as the Interagency Working Group on HABHRCA. This Working Group is organized under the National Science and Technology Council; Committee on Environment, Natural Resources, and Sustainability; Subcommittee on Ocean Science and Technology. 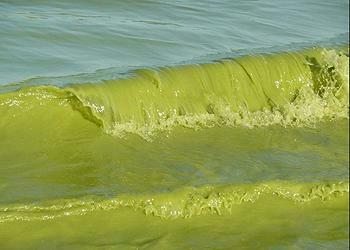 In February 2016, the Working Group published a report to Congress that recommends a five-part action plan for coping with harmful algal blooms and hypoxia. All five parts are interrelated. Part 1: Add to and improve scientific understanding of HABs and hypoxia, and their causes and effects; improve testing and research methods. * – the need for more science to understand the influence of a changing climate on HABs and hypoxia, and the need for tools to manage a limited availability of certified reference materials and validated detection and analysis methods. The Working Group recommends the development of an interagency group specifically tasked with examining the possibility of developing certified reference materials and other standardized and validated detection and analysis methods. Part 2: Strengthen and integrate new and existing monitoring programs. A thorough and science-based monitoring program is key to determining the location and extent of HABs and hypoxia events, so their causes can be controlled. Comprehensive monitoring is done by maintaining long-term records of environmental conditions to monitor future changes and provide data on how a changing climate may affect HAB and hypoxia events. It is also important to incorporate new technologies into monitoring systems; use observations to validate existing computer models; and identify indicators that can predict and identify HAB and hypoxia events at the local, regional, and national levels. Part 3: Improve predictive capabilities by developing and enhancing computer modeling programs and remote satellite sensing. Improve disease surveillance for human and animal exposure, illness, and death. A rapid response system is necessary for detecting and mitigating HAB toxins in humans and animals. Part 4: Improve stakeholder communications. 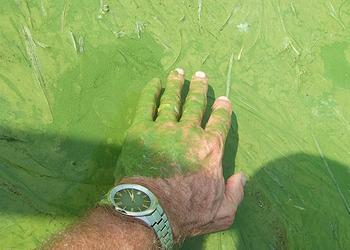 Develop more effective and available public advisories, stronger connections with susceptible communities, and a better understanding of the socioeconomic and health-related impacts of harmful algal blooms and hypoxia. Communication among wildlife, veterinary, medical, and public health officials, and with the general public, needs to improve, the Working Group says. Part 5: Continue and expand collaborations in research, management, and policy-related arenas between federal agencies, as well as between these agencies and state and local entities, the public, and academia. In developing this report, the Working Group engaged with nearly 1,000 stakeholders representing a wide range of interests. Over 100 of them submitted detailed input. Stakeholder representatives included: state coastal management and planning officials; tribal resource management officials; water and watershed management officials from both coastal and noncoastal states with source waters that drain into water bodies affected by HABs and hypoxia; national park and federal land managers; public health officials; emergency management officials; science and technology development institutions; economists; industries and businesses affected by marine and freshwater HABs and hypoxia events; scientists with expertise concerning HABs or hypoxia from academic or research institutions; and members of the general public. After considering input from these stakeholders, the Working Group report outlines needs, gaps, and successes, and provides a series of recommendations for addressing HABs and hypoxia in the United States to ensure continuity of goods and services for the future.